Today, we went hiking down in the Rillito River Park in Tucson. Most of it is sand, and people ride horses, walk dogs, and walk along the banks of this river, but there are also areas where there is patchy brush. A family member’s dog was with us and likes to sniff around in the brush. And, it is also easier to walk in the brush because the sand is a bit harder. As we were walking, I was thinking about the possibility of encountering a snake and I was looking for them. There is lots of sand between most brush, so I felt they would be relatively easy to spot. 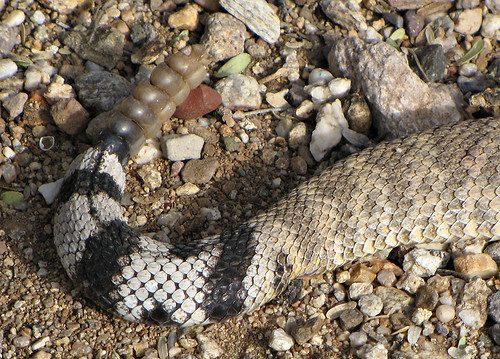 But just like that last time I saw a rattlesnake in Tucson, you can be almost step on them before you ever see them. That is how well they are camouflaged. In this case, none of us saw this BIG rattler. The dog ran right by it, and he was a step or two behind. The snake SHOCKED us all by its aggressive noisy “rattling“. The dog froze and had absolutely no clue that is was anything other than a stick. The rattlesnake was in this strike position, and I thought it was going to strike. We grabbed the dog and pulled him away. 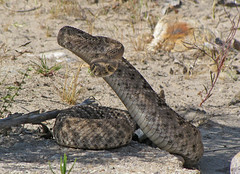 The rattler remained in the strike position and was very upset. I quickly took a few photos, and then got the out of there fast. We are just very glad this snake was only loud and allowed us to back off. Be very careful hiking in the desert, especially this time of year!